Indian-born, New York-based artist Siona Benjamin creates a unique visual language that presents her transcultural, transnational view of the world. Her work is a reflection of her diverse background and the occupation of liminal space between old and new worlds of culture and intersectionality. Like the artist herself, her art amalgamates numerous artistic styles, religions, languages, mythology and iconography to create a true plurality of cultural imagery. 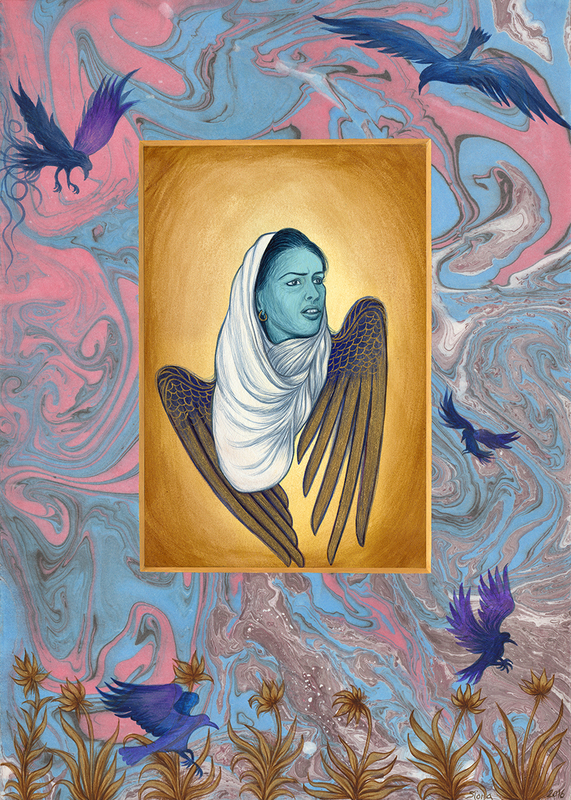 Her influences include everything from ancient Indian and Persian miniatures to Sephardic icons and contemporary graphic novels, and elements of these are the basis of her art. Benjamin was raised Jewish in a predominantly Hindu and Muslim India, while being educated in Catholic and Zoroastrian schools. She now lives and works in New Jersey. Benjamin explains, “I would like my audience to re-evaluate their notions and concepts of identity and race, thus understanding that such misconceptions could lead to racism, hate, and war. Very often I look down at my skin and it has turned blue. It tends to do that when I face certain situations of people stereotyping and categorizing other people who are unlike themselves. I have therefore over the years developed many blue-skinned characters in my paintings. This blue self portrait of sorts takes on many roles and forms, through which I theatrically explore ancient and contemporary dilemmas. Programming for this exhibition was sponsored by Cal Lutheran Campus Ministry–Jewish Life. Many thanks to our loan partners Osher Marin Jewish Community Center and ACA Galleries, New York. Image: Siona Benjamin, Exodus #1, Gouache and Mixed Media on Museum Board Mounted on Wood Panel, 14 x 10 inches, 2016. Courtesy of the artist.